Ikea, the build-it-yourself Swedish furniture company, announced recently that it is joining the new-and-improved Boston Calling food lineup and providing a vegetarian version of its best-selling hot dogs. The festival will also serve as the official US debut of the new product. The veggie dog is primarily made of kale, red lentils, quinoa, onion, carrots, and an array of spices, including ginger and turmeric. They are then topped with spicy mustard, pickled red cabbage, and roasted onions. “It’s a quite simple concept, we serve 660 million people a year on a global basis, and 100 million hot dogs in a year, globally, so it’s quite natural to start with a top-seller and make an alternative which is healthier and more sustainable,” said Michael La Cour, managing director at Ikea Food Services. But why debut these dogs at a three-day music festival in Boston, of all places? The vegetarian-friendly franks will be sold at the festival for $4, and an “enhanced” version is in the works as well. 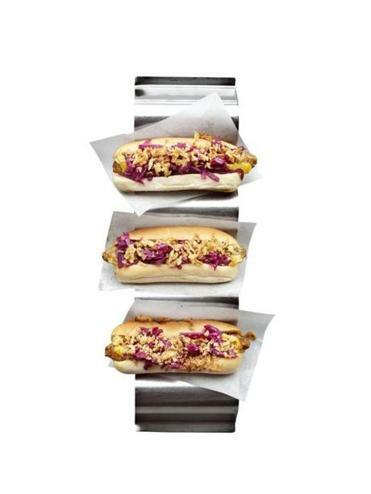 The veggie dogs will be available at Ikea stores throughout the United States in the fall. Sophie Cannon can be reached at sophie.cannon@globe.com. Follow her on Twitter @the_grandCannon.